Darksiders dev Gunfire Games' next project is an attempt to make a shooter that's incredibly replayable, but less grindy. Remnant: From the Ashes occupies a space somewhere between the dopamine-soaked looting of The Division 2 and the scrappy co-op of Left 4 Dead. This is a third-person, three-player online action game about going on endless dungeon runs, fighting bosses, and accumulating new weapons and armor for persistent characters. But it's not about grinding through piles of junk gear in the way that Diablo or Destiny often are. "There is loot, but our mantra has always been that every item in the game is given the treatment of a legendary item in another game," says David Adams, co-founder and president at Gunfire Games, the studio behind Darksiders II and III. "Instead of endless drops of incrementally different items, we have a bunch of handcrafted, unique items for the player to discover." You can visit vendors in Remnant's hub level to upgrade the base attributes of weapons and armor with crafting resources, but this takes a backseat to bigger augments that will add entirely new alternate fire modes to weapons, and there will be a separate tier of guns that only bosses drop. 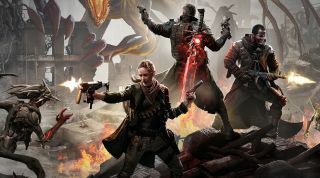 Though his studio is smaller than the likes of Bungie and Ubisoft, Adams is eager to differentiate his team's game, which he says doesn't belong to the looter-shooter subgenre. Yes, damage numbers float over enemies as you fight them. Yes, there's a standard inventory screen where you might swap your body armor to optimize your dodge rolling for an upcoming boss fight. As I play an early version of Remnant, the experience does feel less cluttered and more streamlined. The studio's goal is to create an action game that maximizes replayability by doubling down on procedural generation and variety. "As a simple example," Adams tells me, "one time through the game you may face off against a dragon as the final boss in our Ruined City world, the second time through you may face off against a giant tree. Bosses, events, dungeons, layouts—all of these things are randomized each time you play, allowing you to replay the game without having to replay the exact same game." Games that promise bottomlessness rarely deliver what we hope they will. It's encouraging to hear that Remnant will have over 100 enemies and 20-plus bosses (Adams remarks in respectful disbelief during my hands-on that The Division only has a handful of unique character rigs), but without playing the full campaign, I can't tell how distinct the behavior of these creatures will be. They'll be spread across four worlds, and most of these worlds will have four zones of their own, meaning their art won't be uniform. The exact depth of Remnant's content well remains to be seen, but I was able to get the most basic sense of it after playing for about an hour. Replaying a section on the opening world, an Earth that's been ravaged by—let me check my notes—a race of interdimensional tree aliens, Remnant was dealing me new layouts in open city areas and narrow, underground utility tunnels. Each time I reloaded the zone the game laid out a map with different amounts of cover, new stairway arrangements, or threw a different miniboss at me. These differently-arranged level pieces came at the expense of some decoration, though, and were pretty desolate as my character brushed by them. The generated-ness of the map was evident from the lack of stuff like environmental storytelling. There are only so many ways you can arrange bathroom skeletons, but I'd love to see more polish in this area. Adams does say that Remnant will have "a lot of secrets ... lots of little things for players to discover and unfold within the game world," so I'm looking forward to seeing how that weaves into its procedural generation. Overall, I did like the art direction of the Earth level, the way everything feels like it's covered in a layer of world-ending dust allows the ruby hues of enemy bodies to stand out as threats without the use of clunky UI. But if XCOM 2 can find ways to tell tiny stories on its randomized chessboards, Remnant can too. In your hands, Remnant's over-the-shoulder combat style feels measured, heavier than games like The Division. You don't feel like you're controlling a linebacker in plate mail like in Gears of War—Resident Evil might be the better comparison. Adams describes the combat style as deliberate. "We don't want players running in and just shooting everything in sight with no thought or concern for what they are fighting. Combat is meant to be tough, but rewarding. Uniquely, it also features a seamless combination of both melee and ranged combat. While guns are the primary weapon in the game, players can seamlessly incorporate melee into their combat—and, in fact, most players will find themselves switching back and forth depending on which enemies they are facing." This is exactly what I experienced. One of my least favorite minions were packs of spherical monsters that charged at me in underground sewer areas. These mobs of angry grey beach balls attacked in messy rows, and trying to shoot them all down one by one with a pistol or rifle proved less effective than just waiting for them to get in at knee-level and timing a melee swing to one-shot several of them at a time. It's safe to say that Remnant isn't trying to be Dark Souls. The basic enemies spawning in the earliest areas of the game were simple to dispatch. But I was happy that the mixed enemy compositions eventually meant that I couldn't exploit the same dodge roll in every situation, and had to make basic but fun considerations about when to just swap weapons, when to reload, and when to conserve ammo with a melee strike. It surprised me that one of the biggest enemies I saw was the fastest, a burly spear-thrower in Remnant's jungle world who would occasionally blur into a horizontal dash. Taking together what's promised and what I played, the game that Remnant reminds me of the most is probably the top-down roguelike Enter the Gungeon. You're able to recognize some layouts and the tendencies of the spawning systems over time, but the way things are arranged feels shuffled and unpredictable from playthrough to playthrough, and the promise of deeply-buried secrets is a good carrot for that 83rd playthrough. Even if Remnant doesn't consider itself a looter shooter, it'll be subject to a lot of the same expectations around updates and longevity, but I think its emphasis on 'less is more' looting could attract a different audience. Remnant will release on Steam on August 20 at $40.